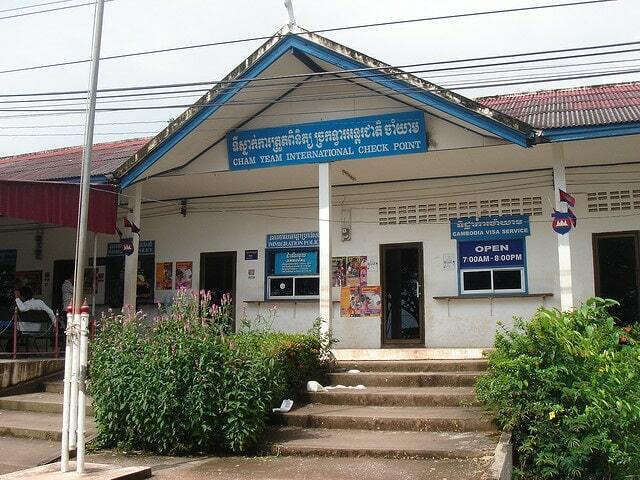 The border is at Cham Yeam, about 10 km by road northwest of the town. It faces Hat Lek in Thailand. Motos (US$2 to 2.5), shared taxis and taxis (US$9 to $10 for the entire car) run between the town and the border. Drivers will ask for more (asking for 400 baht is common) - don't let them. Negotiate in dollars rather than baht, baht prices always work out more expensive. If you take a tuk-tuk from the border, you will have to pay 6-7 dollars for the trip, depending on your negotiations skills. You can share the costs if you travel with someone. If you take a Taxi, driver will ask you to pay 100 bath or 3 dollars each and he will wait till he has 4 people on board. 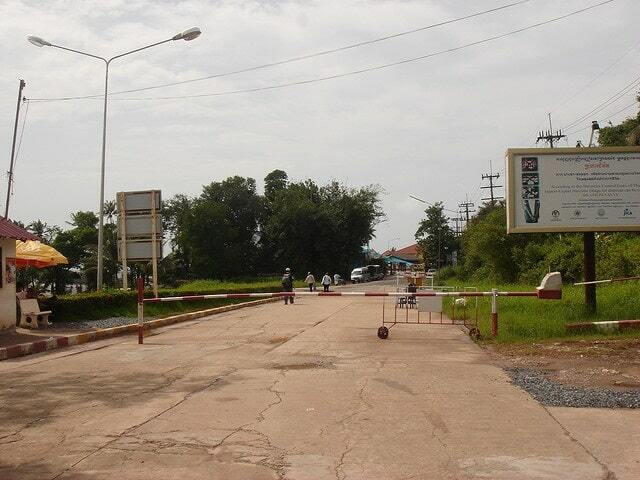 You do not need to pay toll fee for passing the bridge in tuk-tuk or taxi. It's included in the price. If you take a moto it might be possible that you have to pay toll a fee for the bridge (1400 riel for a moto), which can be paid in riel, USD or baht. The rate is stated on the toll booths: it's better to hand over your money at the booth so that your fare is not impacted later. After you get your passport stamped with the Thai exit stamp, walk down the road, and the arrivals office is on the left side of the street. Ignore the fake quarantine station . If you allow the touts to direct you there, they will take your temperature, give you a bogus form and ask for 20-400Baht. You do not need this form and you will not be asked for it when you apply for your Visa or entry stamp. The fee for a tourist visa is US$20. You may be asked for 1000-1300 baht (about $30 USD) or for $20 with an additional 100-300 baht fee. If you pay, you'll likely have your visa very quickly. Insisting on paying only $20 may lead to being made to wait, though the visa will come. Arriving early can help, as in the late afternoon a corrupt official knows that a delay could result in missing onward transport, which makes the bribe seem more attractive. Whenever you arrive, be polite, say hello (sue-saw-day) and thank-you (awkunh) in Khmer and you should find no problems. 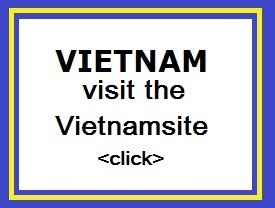 Cambodian visas are available on arrival. Tourist visas cost $20 and permit one stay of up to 30 days. The paperwork is very simple. It requires no assistance, regardless of what touts may say. Forms are available at the counter to the left of the visa window, although a "helpful" tout will likely offer you one as soon as you approach the office. Take the form and otherwise ignore the tout. A passport photo is required for the visa. A 100 baht fee applies if you don't have a photo. You can also pay in Thai Bath, but the visa fee of US$20 will translate to 800 Bath. Better stock up in US$ before the border or change money outside the building, where you�ll get slightly better rates. Once you have your visa, brush off the touts and go to the arrival window to get your entry stamp into Cambodia. From the immigration, you have to find your way down a small rugged road to the river. The first few motocycle taxi drivers will speak English well and ask a lot of money. Ignore them, and keep on walking down the road. In about 250 meters there is the main group of taxi drivers, where the standard fare to Koh Kong town is normal (including the bridge toll). It takes around 10 minutes to reach the centre of town. Peam Krasop Wildlife Sanctuary (2 km out of town). It's an organization run by local villages tying to preserve their local habitat. It is part of probably the largest mangrove estuary left in Asia. You can get there by bike; by foot; tuk tuk. If you hoof it ;wear a hat; bring water; and start walking early in the morning. It probably woud take 1.5 hours to walk. You pass some really interesting plant life growing in sand and mangrove mud flats. You can take a boatride on the estuary (hire a boatman) for about $20; it is worth it. Baklang Beach. Across the bridge toward Thai border and turn left at the kings statue (it looks like a Buddha). You can bike it. Very nice mangrove tidal flats. It is an easy 5km. There is a row of fish shacks lining the beach. If you want to eat something... ask the price first... the food tends to vary in quality, better to have a cold drink. During the rainy season the water is muddy but a very nice respite during the dry season. Baklang village is further down the road. Some fishing boats that's about it. If you bike go early and leave plenty of time; be back by dark. Ta Tai River. 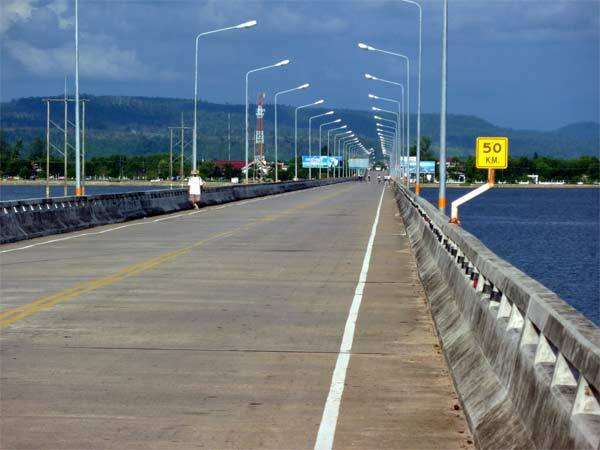 This the 1st bridge before you arrive in Koh Kong. Very nice to take a boat ride to the waterfall and have the boatman take you the other way back under the bridge... down river. Cost about $25.